Consider it a lesson learned. 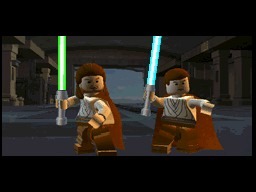 Lego Star Wars: The Complete Saga is a must-own for the DS, unlike its previous entry. If you had asked me a year ago if I was up for recommending a Lego Star Wars game for the Nintendo DS, I probably would've violently shaken my head before running at full speed into a brick wall. Well, okay, I probably wouldn't have gone THAT extreme, but I would have gone to great lengths to avoid recommending Lego Star Wars II: The Original Trilogy for the system. The DS version was so far out of whack that it was virtually unplayable, what with its many bugs and glitches. It's almost as if LucasArts rushed the game out the door before testing had even begun on it. What a difference a year makes. Lego Star Wars: The Complete Saga is a far better game, with almost one hundred percent fewer bugs and, in its place, one hundred percent more fun. You'll find all six Lego Star Wars chapters here, spanning from the events of The Phantom Menace to the final showdown in Return of the Jedi. You'll find yourself in control of several characters over the course of the game, including Obi Wan Kenobi, Han Solo and many others. You can even choose villainous characters, which are unlocked over time. The thing about Lego Star Wars is that anyone can pick up and play it. The gameplay is genuine fun, as you use your weapon of choice to break up enemies into little piles of blocks. You can also use Force powers with some characters to collect trinkets that are turned around in a virtual shop to buy specific items, such as cheats and extra characters. Gold pieces are also earnable, which then unlock special mini-games specifically designed for the DS version. These mini-games are a blast, ranging from dodging incoming items during a race to blasting asteroids, old-school style. You can even use the touch-screen to activate specific powers, although if you prefer button-pressing, that's an option here, too. The game looks and sounds like a Lego Star Wars game should. There are a few sacrifices made with this home port, like the crude cutting of specific scenes and the lack of certain musical cues and sound effects. Past that, however, everything's in place and running smoothly. The animation looks great, the level designs are on the money, the game runs at a decent frame rate and John Williams' music score sounds terrific. 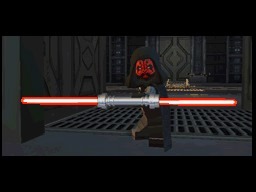 The only thing that might get on your nerves is that, basically, this is still the Lego Star Wars series you've been playing for the last couple of years. There's no real significant change to the formula. Still, it is what it is. The only real complaint about the DS version is the lack of support when it comes to multiplayer. You can hook up with a friend who owns a second copy of the game for two-player action, but there's no Game Sharing option for some reason. Worse yet, unlike other versions of the game, it doesn't support the Wi-Fi Connection, so you can't hook up in a Stormtrooper stomping spree with your cousin from Norfolk. It's a small quibble, but a quibble all the same. Oh, well, at least this version doesn't put you through the same kind of mind-numbing pain that Lego Star Wars II became known for. Lego Star Wars: The Compete Saga is an exceptional home port for the series, and a fine return to form for the Nintendo DS. If you've still got a little bit of Force in you (and, really, who doesn't), then summon it to your game library today. Besides, Princess Leia in a slave outfit is a total block hottie. What's Hot: A much better game than Lego Star Wars II; enhanced mini-games and touch-screen Force powers; goofy fun for all ages. What's Not: No Game Sharing or Wi-Fi Connection options; formula is nothing new for the series.